High dimensional flow cytometry data analysis is complicated, to say the least. Our expert scientific team has experience in various therapeutic areas of research and can not only evaluate your high complexity data, but can also provide biological relevance to your studies. 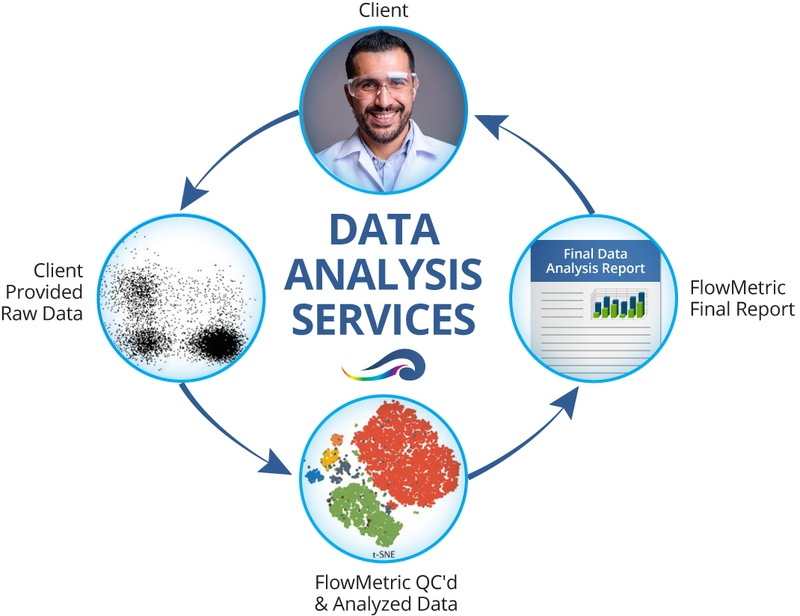 We specialize in high dimensional (12+ color) flow cytometry data analysis services and have a team in place to analyze your datasets to meet your tight timelines. Currently, FlowMetric offers flow cytometry data analysis of your .fcs files using FlowJo™ software. We partner with you to create a gating strategy, analyze your datasets in minimal time, provide 100% QC analysis of each data point using a highly qualified senior flow cytometrist, and provide secure transfer of the data in a format of your choice. Additionally, we can utilize computational cytometry tools such as t-SNE flow cytometry data analysis to help understand and visualize highly complex large datasets for your projects. Are you struggling with flow cytometry data analysis? Speak with a FlowMetric expert today.